Water Conditions: Fairly clear and not too low. 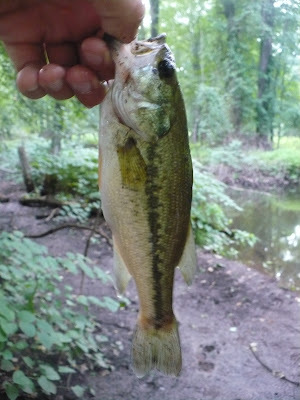 The last time I fished Lenape Lake, someone mentioned there was a small creek in the woods that had fish in it. Once the Sunday reports were done, I decided to see if I could find it and catch a few bass. After parking my car, I grabbed the utility box with small minnows and followed a trail through the woods. A short hike later, I found some elbow room on the shore and began my mission. It didn't take long to catch my first bass, and after doing so, something occurred to me. When I started to think about the last week of fishing, I realized that although the small fish you see above unimpressive in every sense of the word, it's actually a significant catch. I'm too unmotivated to go back and check 3 months of posts, but I am nearly 100-percent certain that the last 6 days of successfully catching a fish marks the longest streak since I have started this. Should I catch a fish tomorrow, it will undoubtedly be the first time that I have caught a fish every day for a week straight. This deer hung-out with me while I was fishing. Lucky for him I don't own a gun. Thanks for sharing this very informative tips for outdoor fishing and also hunting.